Black Friday TV deals: Save up to £300 on Samsung's 2018 4K Frame TVs | What Hi-Fi? Black Friday 2018 is well and truly here with deals popping up in the lead up to the main event and likely way beyond. As such this is a great time to grab yourself a new TV, pair of speakers, headphones and plenty more besides. But there's so much to pick from it's best to focus on one thing at a time, in this case there are some impressive savings to be made on Samsung's 2018 Frame TVs. 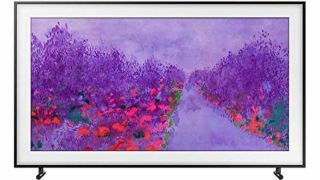 Designed to hang like a picture frame this 4K HDR range boasts an Art Mode where you can use your own high-resolution images to adorn the digital canvas or display them through a subscription to Samsung's Art Store. The 65in version of the Frame TV (UE65LS03) is down from £2499 to £2299, while the 55in version (UE55LS03) has been reduced from £1799 to £1499. You can also make a £200 saving on the 43in model (UE43LS03) which is now down to £999 from £1199. This 43-inch version of the Frame TV squeezes in just under the £1000 price point. Don't worry, you still get 4K, HDR and the frame finish too.